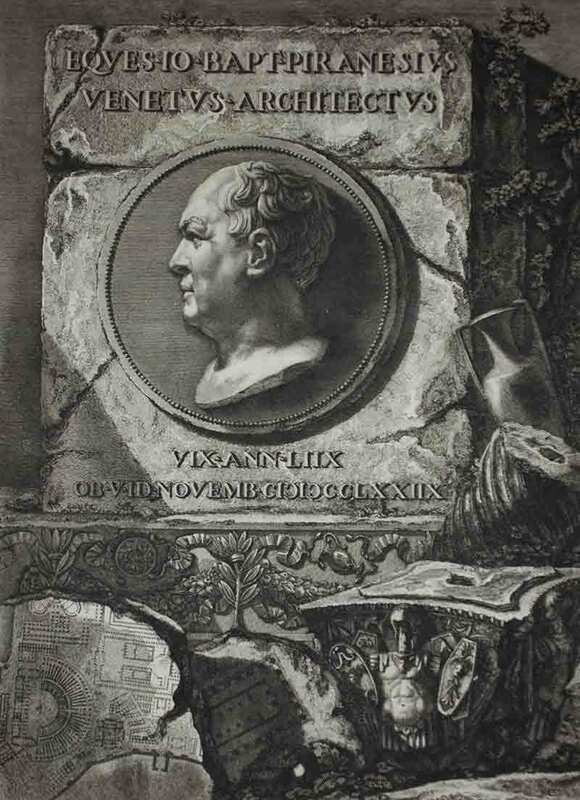 Giovanni Battista Piranesi, the son of stonemason and nephew of an engineer, first trained under that uncle as an architect maintaining the intricate waterworks of his native Venice. Even though he only ever got one job as an architect in his all too short life, he never lost the passion for buildings. It was as an artist that he made his name. He learned etching in Rome and combined his artistic talent with his favorite subject matter to create views of the city that became popular among Grand Tourists. 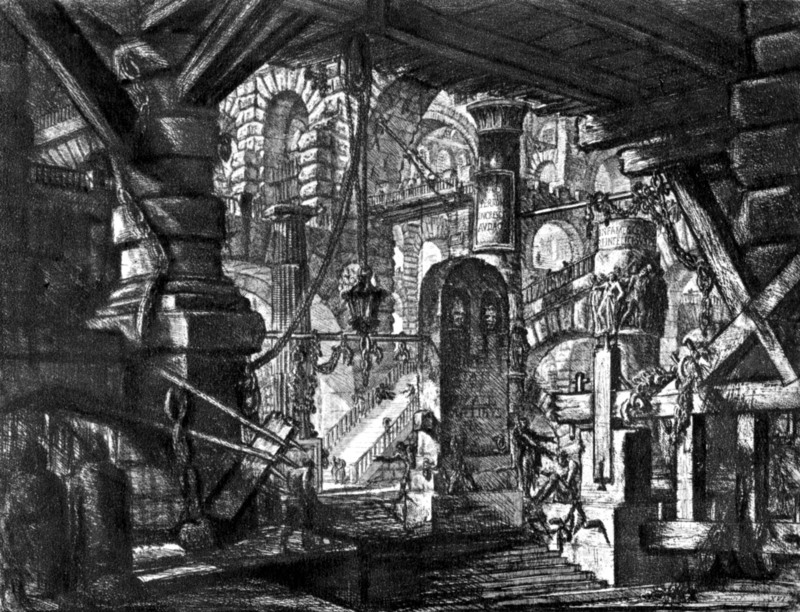 Piranesi’s etchings of ancient Roman architecture were not only captured with the meticulous understanding of the builder, but were drawn with such powerful chiaroscuro dynamism that Goethe, for one, who first came to know the city through Piranesi’s books, was actually disappointed when he saw the real thing. Piranesi didn’t limit himself to depictions of Rome and its ruins for the pilgrims and tourists. In 1745, he began work on an entirely new vision, combining his artistic style and understanding of ancient monumental construction to create a unique group of etchings called Carceri d’Invenzione (Imaginary Prisons). The imaginary part is that they bear no relation to any actual prisons of the era which were mostly cramped dungeon cells in the towers and palaces of the Church and aristocracy. 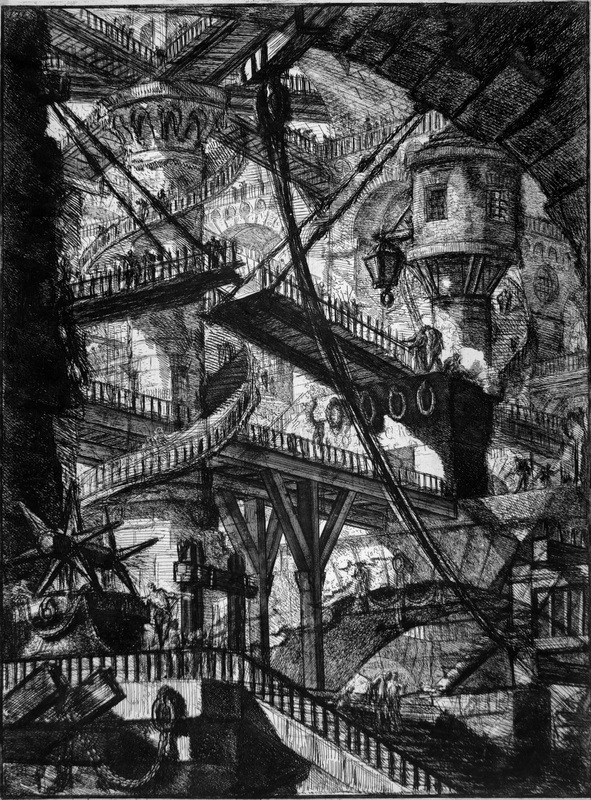 Piranesi’s invented prisons were cavernous labyrinths peppered with intimidatingly suggestive mechanisms where human figures are barely present and dwarfed by their surroundings. The first edition of Carceri d’Invenzione was published in 1750. It was a collection of 14 untitled etchings drawn in a rough sketch-like style. You can see all 14 of the original Carceri in order here. Ten years later, he would return to his imaginary prisons and do a major revamp of the etchings. He added two new ones and fleshed out the others with even more complex architectural features, increased contrasts of shadow and light, arches, staircases and vaults that lead nowhere. 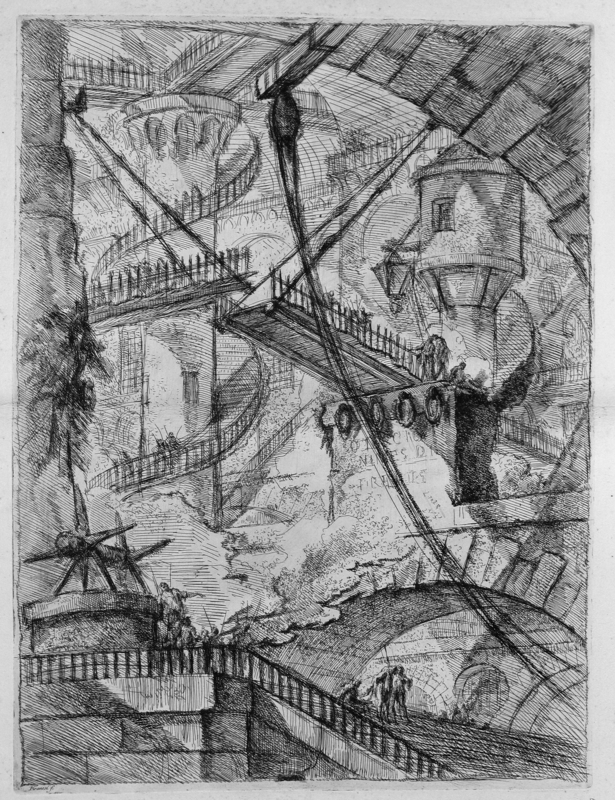 The prison etchings were part of an artistic tradition called the capriccio, a fantasy aggregation of structures and art works that doesn’t exist in real life. These sorts of imaginary viewpoints were popular with tourists because they compressed the “must see” ruins and artworks into one painting. What Piranesi did with the form, however, was entirely new. The prisons were expressions of visions in his mind, not of tourist bullet points. They wouldn’t be purchased as pre-photography postcards, but the prisons’ tenebrous atmosphere and emotional impact were highly influential for the Romantics of the late 18th/early 19th centuries. 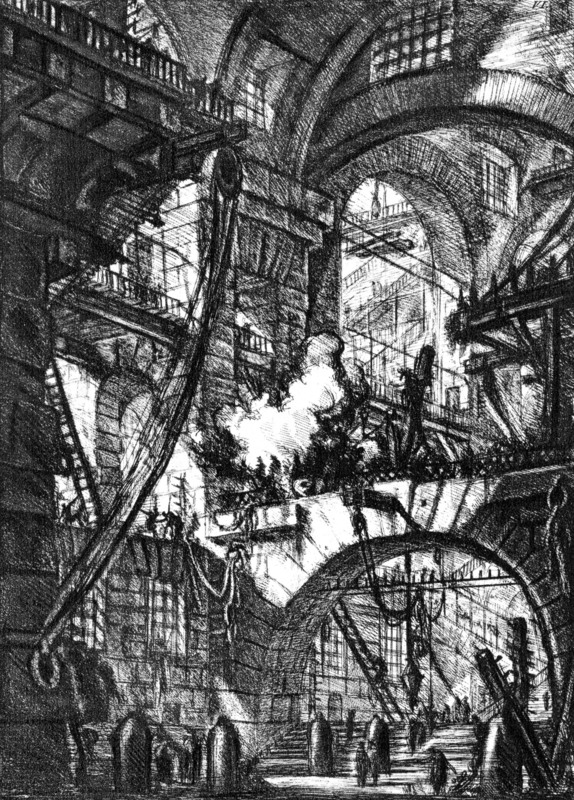 The irrational elements like infinitely regressing passageways would later inspire the Surrealists and if Escher’s Relativity doesn’t owe Piranesi a huge debt, I’ll be a monkey’s uncle. In 2010, the Sale del Convitto in Venice held an exhibition Le Arti di Piranesi: architetto, incisore, antiquario, vedutista, designer (The Arts of Piranesi: architect, engraver, antiquarian, vedutista, designer) to coincide with the Venice Biennale of Architecture. The Carceri etchings played a central part in the show, and graphic artist Gregoire Dupond of Factum Arte brought them to virtual life with an absolutely riveting animation. He took the 16 prints of the second edition and transformed them into a three-dimensional space so viewers can travel deep into Piranesi’s imagination. It’s 12 minutes long and it’s nothing short of riveting.